In August 2014 the French artist JR received an unprecedented invitation to work in the Ellis Island Immigrant Hospital, a building on the south side of the island that has been abandoned and closed to visitors since 1954. About ten percent of the millions of migrants who passed through Ellis Island, having been deemed not healthy enough to enter the United States, spent some time in the hospital. For Unframed--Ellis Island, documented in The Ghosts of Ellis Island, JR chose about 20 archival photographs of the hospital's patients and staff and wheat-pasted these images around the abandoned building, creating haunting scenes that bring the history of these rooms back to life: a family looking out at the Statue of Liberty in New York Harbor, a small boy lying on an empty bed frame, patients staring out of the caged "psychopathic" ward. The work, which is accessible by guided tour, will remain up "until it decides to disappear." 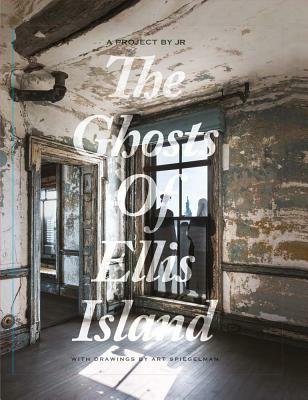 Along with images of JR's photographic interventions in the hospital, this publication includes new illustrations by legendary cartoonist Art Spiegelman, who collaborated with JR on illustrated narratives about Ellis Island's immigrants. JR (born 1983) is best known for his monumental, wheat-pasted street portraiture projects. His ongoing project Unframed involves installing archival images and images from anonymous photographers in new contexts. JR has carried out Unframed projects in Marseille, S o Paulo, Vevey, Atlanta, Baden Baden and Washington, DC. In 2014 he worked inside the theater of the NYC Ballet creating a 6,500-square-foot composite image of NYCB dancers depicted nearly life-size that, when seen from above, forms a giant eye. JR won the TED Prize for 2011.